This week, we're offering a special giveaway in partnership with the #Write_On challenge, taking place throughout the month of April, which is National Letter Writing Month. The challenge is lead by Egg Press, a greeting card company, design studio and letterpress print shop based in Portland, Oregon. Founded in 1999, they’re pioneers in the resurgence of letterpress printing and are often noted for their sophisticated color palette, hand drawn illustrations, all-over textile inspired patterns, and sense of humor. For our giveaway, we're setting up one lucky winner with supplies to practice their hand at calligraphy! The prize includes a copy of our Issue #6: Symbols, which features a guide to hand lettering by Michaela Yee, three collectable ILLUSTORIA pins and bookmarks, a Sakura Gelly Roll pen, very adorable Write_On stickers, and a stash of Write_On cards by Egg Press and Hello Lucky Cards. Check our Instagram post for entry guidelines! One winner will be picked at random on March 27th. When was the last time you took time to write a handwritten letter? In today’s fast-paced, media-saturated world, letter writing offers a path for slowing down and engaging with others in a meaningful way, expressing ourselves, and noticing and savoring the present moment. Write_On began when Egg Press Founder Tess Darrow realized that, despite having a studio full of beautiful greeting cards, she wasn’t devoting as much time as she’d like to correspondence. In 2014, she challenged to herself to write 30 letters in 30 days, about the amount of time it takes to develop a lasting habit. Tess invited the entire Egg Press staff as well as the co-founders of Hello!Lucky, Eunice and Sabrina Moyle, to join the fun. They all agreed that connecting with loved ones through a strong letter-writing practice was a great way to affirm their founding principles. What started as a humble effort has grown into a global movement! The possibilities for your letters are endless. For more inspiration, visit the resources page of the Write_On website here. Stock up before April 1st! With the help of our Write_On partners Hello!Lucky, Sakura of America, and Mohawk papers, we’ve got a collection of writing prompts, tips, and resources available at writeoncampaign.com as well as a shop full of custom designed and printed goodies to make participation in the challenge easy and fun. 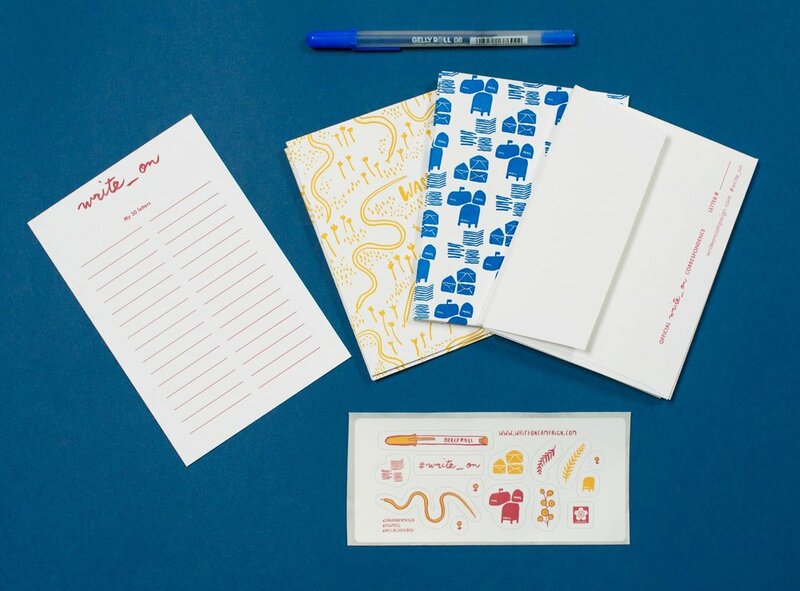 We're also offering two different Party Pack variations, packed with everything you need to host a letter-writing shindig for 10 to kick off the Write_On Challenge. For every purchase of a Letter-Writing Kit, we’re able to donate a kit to someone in need, including educational and under-resourced community programs across the country. Visit the Write_On shop and stock up before we sell out! We welcome your correspondence and creative mail all year round. Your suggestions and feedback help inform the direction of the Write_On Challenge each April, so please, be in touch! For more details on the campaign, visit the Write_On website at writeoncampaign.com.